In large pot heat oil and butter over medium-low heat until the butter melts. Add the onion and garlic and cook, stirring occasionally, until soft but not browned. Add broth, tomatoes, sugar, thyme, and 1/4 teaspoon each of salt and pepper. Add flour and stir to coat the onion and garlic. Return to clean pot and season with salt and pepper for taste. Reheat if necessary. a dollop of sour cream, or a parmesan crisp. In large pot heat oil and butter over medium-low heat until the butter melts. Add the onion and garlic and cook, stirring occasionally, until soft but not browned. Add flour and stir to coat the onion and garlic. 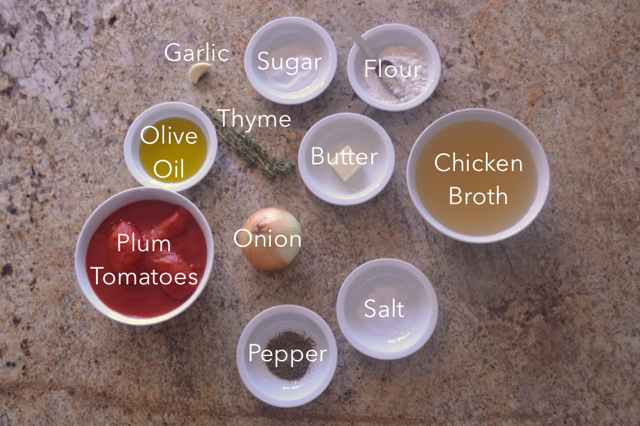 Add broth, tomatoes, sugar, thyme, and ¼ teaspoon each of salt and pepper. Bring to simmer over medium-high heat while stirring the mixture to make sure the flour is not sticking to the bottom of the pan. Reduce heat to simmer and cover for 40 minutes. Add flour and stir to coat the onion and garlic. Discard thyme sprig. Let cool briefly and then purée in two or three batches in blender or food processor. Return to clean pot and season with salt and pepper for taste. Reheat if necessary. Serve warm with herb garnish such as basil, dill or chives, and maybe a disc of goat cheese, a dollop of sour cream, or a parmesan crisp. I like to put the soup in shot glasses with a small grilled cheese wedge and serve as an hors d’oeuvre.